Chaudary says to Twinkle that you have to prepare for marriage in one day, just finish this wedding, tomorrow is Holi, we celebrate is grandly, functions should not be affected by all this, Twinkle nods. Kunj and Twinkle are sitting in tractor, Kunj says i have to bring Raja back, Rajjo has given me his address, i wont let anything happen to them, i will tell truth to Chaudary that raja is Rajjo’s boyfriend, not me, dont worry about me, nothing will happen to me, Twinkle cups his face in her hands and says i know nothing will happen to you as problem has to face me before coming to you, i wont let anything happen to you, they share eyelock, Sajna ve plays, Kunj says i should leave, Twinkle stops him and says today is our first Holi together, she colors his face and says happy holi, Kunj pulls her closer, Sajna ve plays, Twinkle gets tensed, Kunj comes close to her and smear color on her face by rubbing his face on her cheeks, he says happy Holi Mrs. Twinkle Sarna, Twinkle smiles. Twinkle is at holi function, she says Kunj should bring Raja back soon, they should not know that Kunj is not here. Sangram comes to chaudary and says Kunj is not seen anywhere, he has runaway, chaudary angrily looks at Twinkle, he comes to her and asks where is your brother? Twinkle says why would he runaway? he wants to marry Rajjo, he knows that if he tries to runaway then you will kill him, he must have gone to market, he doesnt need permission to go out of house, Chaudary asks Sangram to go and find Kunj, Chaudary says to Twinkle that if he is trying to runaway then we will catch him and wont spare him and if he is not caught then you will not be spared, Twinkle gets tensed listening this. Rajjo says to herself that i cant punish Kunj for all this, he saved my life and now his life is in danger, i have to find raja and bring him here then i will tell truth Chaudary, Kunj should not be punished for my deeds, she leaves. Chaudary is waiting, Sangram comes and says Kunj is not seen in village, he is missing, Jiji comes and says Rajjo has runaway from house, all are shocked, Jiji says she must have gone to suicide because of shame, Twinkle thinks why did Rajjo runaway? Chaudary gets angry and leaves. Holi ceremony starts, Dhols starts playing, Yuvi comes there playing dhol, Twinkle is stunned seeing him, she thinks how did Yuvi come here? Yuvi stares her, Yuvi recalls flashback how he saw kunj and Twinkle on tractor, he says wow this is nice scene, its interesting story, starring kunj, Twinkle and my sister Rajjo but i will end this story, this Holi is going to be last holi for them, fb ends, Yuvi thinks that Twinkle seems shocked, to their badluck, i had listened their talk in morning and have made my master plan. Kunj is finding Raja when some people come to him and kidnaps him. Yuvi comes to Twinkle and says are you shocked seeing me here? i have to tell you something, i know everything whats going on here, i know about Rajjo and Raja, i know what lie you are telling here, one more news, Kunj is being kidnapped by my men, all are thinking that Kunj has runaway, i am feeling bad for Kunj, dont know how he must be, happy Holi baby, Yuvi says to Chaudary that your nephew has come, Twinkle thinsk Yuvi is relative of Chaudary? Yuvi comes to chaudary and asks why he is tensed? Chaudary tells him everything, Yuvi says that groom has runaway? he has high height and fair complexion? Chaudary says yes, Yuvi says i saw him on bus-stop, he was asking about bus going to Delhi, Chaudary says i wont spare him now, he goes to to find Kunj, Twinkle sees everything, Yuvi’s man tells him something, Yuvi thinks that till Sangram will reach bus-stop, my men will leave Kunj at bus-stop, Sangram will think that Kunj was trying to runaway then Chaudary wont leave him. Sangram brings Kunj back to house, Kunj is shocked to see Yuvi there, yuvi smirks to him, chaudary holds Kunj’s collar and says how dare you runaway like this? Kunj says you are thinking wrong, Chaudary says dont lie to me, i hate lies and you are lying everytime, Kunj says i am not lying, Chaudary says because of you, Rajjo has gone to kill herself, i wont leave you, he takes sword and is about to attack on Kunj but Twinkle comes infront of Kunj, Chaudary is about to hit Twinkle but Kunj holds sword with his hand, Yuvi gets tensed for Twinkle too, Chaudary is shocked, he puts his sword down, Twinkle hugs Kunj tightly, Sajna ve plays, Yuvi thinks she is mad girl, she was going to give her life for Kunj, what if something had happen to her, he gets angry seeing them, Chaudary says you didnt do good by saving him, i will kill you too, Yuvi thinks that Twinkle should not be in danger, i wont let it happen, Twinkle says you can kill me but i wont allow you to touch Kunj as he is my husband, we are not siblings, we lied to you and you know why? she tells him everything how Kunj saved Rajjo and how she lied to Chaudary, she says to save Rajjo, Kunj has put his life in danger, you wanna kill him? Chaudary says you kept fooling me, i wont leave you both, i will see Rajjo and Raja later but i will cut you both now, Yuvi says listen to me, whats Twinkle’s fault in it? she has told you truth, if you wanna kill then kill Kunj, Chaudary says she lied to me too, i wont leave her, he asks Sangram to put them in storeroom and find Rajjo and Raja too, i wont leave anyone, Sangram takes Twinkle and Kunj from there, Yuvi thinks i cant let it happen, i have to save Twinkle somehow. Sangram puts Twinkle and Kunj in storeroom, he locks them and leaves, Twinkle winces in pain, she says sorry to Kunj, Kunj says why are you saying sorry? why did you put your life in danger for me? you never listen to me, why you do everything alone? why dont you listen to anyone, you never think about anyone else, why did you do that stunt? why did you come infront of me? what if you got hurt by sword? you should have atleast thought about me, what if anything had happened to you? Episode starts with Kunj scolding Twinkle & Twinkle replies that she will risk her life any time for Kunj. UV was standing behind the door and was listening their conversation Twinkle sees UV & Hugs Kunj tightly & tells him to hug back to trick Yuvi and escape from Chaudary’s house. UV gets frustrated seeing them together & opens the door, he asks Twinkle to dump Kunj & come with him as he can not see her in pain. Twinkle and kunj pushes him and ran, Yuvi breaks the door and informs Chaudary, While running Twinkle gets hurt & Kunj removes the thorn from Twinkle’s feet. On the other side in Sarna house Leela & Bebe wish Mahi on Holi,Mahi is heartbroken & cries hugging Leela but hides the fact, Mahi remembers all UV’s Gyp & decides to end her life. In the jungle Sangram & Uv decides to search. Twinkle asks Kunj to rest for sometime in a Tent Kunj agrees seeing her hurt her leg. As kunj was trying to remove the handcuff twinkle said that she is having no problem in staying this way with Kunj, Kunj suggests to break it and get out of forest sooner. Uv searches in forest for TwiNj,Twinkle suggests Cooking & Kunj asks her to eat watermelon they have a small nok jhok .Twinkle struggles,Kunj teases her & makes her eat Watermelon with his hand,they share eyelock. Yuvi keeps searching all around, Kunj asks Twinkle to take rest & he will stay awake to keep an eye. Twinkle stops Kunj and she gets closer to him & Kunj puts his hand around & Twinkle lays on his shoulder. Yuvi sees tent in jungle, he slowly comes near it, he opens to find no one inside, Sangram and Yuvi looks around, Yuvi finds hand cuffs and says they were here but ranaway, go and catch them. 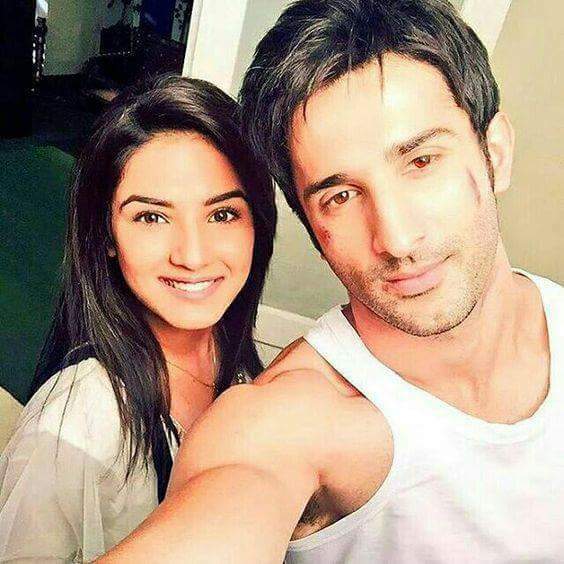 Kunj and Twinkle are running away. Yuvi with his men are searching for them. Twinkle says to Kunj that i can run anymore, i am tired, Kunj says just walk for sometime, dont lose strength, they both run. Twinkle is tires and says i cant walk anymore, we should stay here for sometime, Kunj says we cant stay, we need to reach Raja’s village, Twinkle says i cant walk, Kunj asks if she is very tired? she nods, Kunj thinks, he sees a truck going on road, he stops it, he says to driver if he can give them lift to Gangapur(Raja’s village), driver says okay sit, Kunj and Twinkle goes to sit in truck, driver calls Sangram and says the girl and boy you were finding, i have found them. Mahi is lying on her bed, she says all are right, i am coward and cant do anything in life, i cant even do suicide, she looks at knife and cries. Driver stops truck, Kunj asks why did you stop? what is this place? Kunj sees Chaudary coming there with his men, Sangram and Yuvi comes there too, Kunj is shocked. Kunj and Twinkle comes out of truck, Raja and Rajjo are brought there too, Raja says to Chaudary that i love Rajjo alot, please let me go, Chaudary says shut up, he says you should get ready to die, he says Raja will die first, he tried to play with daughter’s respect, Kunj says please think, what is use of these customs and traditions when your children are not happy? just see Rajjo’s eyes, she is sad, Chaudary says you shut up, you lied to me and you know i hate lies, he asks his men to catch them and take them, Rajjo says please let us go, goons take Raja away from there, Twinkle says atleast think about Rajjo’s unborn child, please let them go, Kunj says i know you are miffed but you cant take law in your hands. Goons hang Raja on tree, he is about to get strangled and die, Kunj pushes away goons and runs to save Raja, Yuvi says Kunj always want to become hero, now i will end his story, Yuvi fires at Kunj, Twinkle is shocked and shouts Kunj, Rajjo pushes away Chaudary as bullet was going to hit him and bullet hits her hand instead of Kunj, Bullet hits Rajjo’s hand, Chaudary gets worried, all run to see Rajjo, goons leave Raja, Yuvi thinks that i have messed it up, i should runaway, Yuvi runs from there. Rajjo is brought to hospital, doctor says bullet just touches her hand, she is fine, he leaves, Twinkle says you wanted to kill Rajjo but she saved your life, that bullet could have hit you, these rituals and traditions are not made that you get bound in it so much that you were going to kill your own daughter, in your old age, not these traditions but your daughter is going to stay with you, i know i am speaking alot but you need to realize it, i know they didnt do right but you can forgive them, Chaudary comes to Rajjo and says i am sorry, i was blind to not see your love, i shouldnt have done it, he folds his hand and says forgive me, Rajjo says dont say this, you are my father, Chaudary says i have given you so much pain, i am sorry, he brings Raja and says i will make you get married, he asks Twinkle to prepare for their marriage and everything should be perfect else i wont give you money, Twinkle nods, Kunj says to Twinkle that not only you solved problems which i created here, you also made Chaudary agree to their marriage, i am impressed, i am sorry for not taking your side in Manohar’s case, i should have believed you, Twinkle says its okay, Kunj says if you find it okay then comeback home, not for any property or business but because of my heart, i dont feel good at home without you, please comeback in my life, am i speaking too much? i should stop speaking, Twinkle thanks God in heart. Rajjo says to Twinkle and Kunj that you both had put your life in danger for me, you both have made my father agree for marriage, i am in your debt, Kunj says you both love each other and you both had to be together, Rajjo says its good that two people who love each other have made two other people who love each other to be together, i pray that i have relation with Raja like you both have with each other, you both are very nice couple, Twinkle glares are at Kunj listening all this. (P.s- I had some emergency yesterday. Thank you ‘callmeprincess3’ for doing episodic analysis, it was great help, much appreciated). PRECAP- Kunj says to Twinkle that i was trying to say something from much time, Twinkle says say it then, Kunj says I love you Twinkle, Twinkle says i love you too, she hugs him tightly.